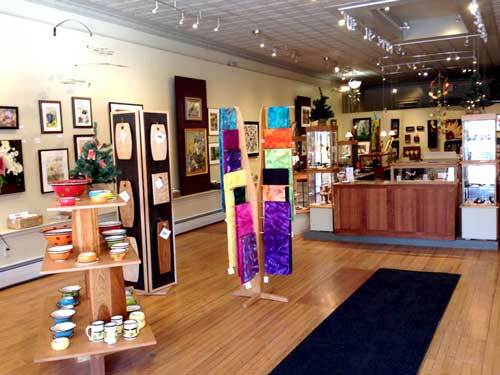 The Guild is a vibrant, diverse group of more than 50 artists in various media, formed in 1999 as under the leadership of renowned folk artist Warren Kimble with the purpose of promoting the arts in the area surrounding Brandon, Vermont. The organization sprang to life when an unused storefront became available and was turned into a rudimentary gallery. The original 12 artists called themselves and their gallery space The Brandon Artists Guild. As a 501(c)3 non-profit cultural organization dedicated to supporting the visual arts and artists through exhibitions, lectures, demonstrations and educational programs, the Guild has particularly backed the arts programs in the local schools and in after-school programs. Events with an art focus continue all year long. The gallery itself is open 7 days a week, from 10 am to 5 pm, and shows featuring the work of individual artists can be seen along with rotating exhibits of all 50 plus member-artists. Click on the “Calendar” page to see the schedule of events. Become a part of Vermont’s vibrant art community. You can join the Guild as an artist member – all media are welcome and the jury meets twice annually. You can also join as a non-artist member. You’ll receive our newsletter, a 10% discount on art bought at the gallery, and special invitations to all Brandon Artists Guild events.